Combined Type 1 and 2 tested protector (to BS EN 61643-11) for use on the main distribution board within wind turbines, for equipotential bonding. For use at boundaries up to LPZ 0A to protect against flashover (typically the main distribution board location) through to LPZ 2 to protect electrical equipment from damage. Use on 690 V three phase mains power supplies and power distribution boards for protection against partial direct and indirect power supplies. The services (typically 3 phase 400 V mains, UPS, data, signal and telecom lines) to the cabinet within the wind turbine nacelle will require additional protection. Protector to be installed in the main distribution panel with connecting leads of minimal length. 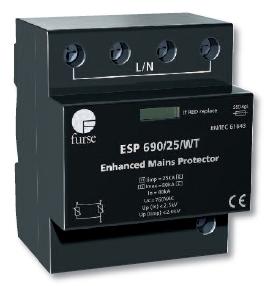 The protector should be fused and is suitable for attachment to a 35 mm top hat DIN rail.